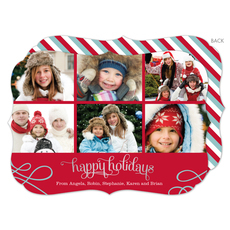 Celebrate the season with our foil stamped holiday photo cards featuring your favorite photo framed in gold foil. Matching blank envelopes are included. Photo cards come with fully printed card back. Size of photo cards are 5.5" x 7.75". You select shape of photo card to be used. Flat printed in ink color as shown. Printed return address available in flat Red ink. Optional envelope linings available. Typestyles and positioning only as shown. 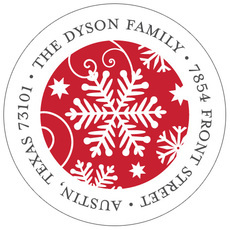 Wording "Joyful Wishes" will always appear as shown. Our gift to you... select any card shape at no additional charge.